W5465NE - "TOGETHER WE CAN..."
Kelly Green Twisted Cord Lobster Clasp Necklace Suspends A Silver Tone "Together We Can Make A Difference" Flip-Flop With A Green Ribbon. Dangling From The Bottom Of The Flip-Flop Are 3 Heart Charm Chains. 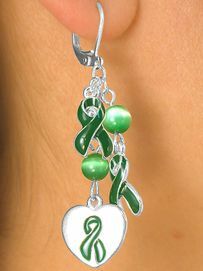 Two Have Kelly Green Ribbons, And The Middle Strand Has A Silver Tone Heart With A Green Ribbon In The Center. Earrings Measure 2 1/4" Long. Scroll Down For View Of Earrings! Show Support For Organ Donors And Kidney Cancer Awareness!! Great For Fundraisers, Sponsors, Walks, Or Just To Show Your Support! !